The New York State Department of Environmental Conservation (DEC) has received a Brownfield Cleanup Program (BCP) application for a site known as Formerly ACCO Brands, site ID #C241061. This site is located in Long Island City, within the County of Queens, and is located at 32-00 Skillman Avenue. Comments regarding this application must be submitted no later than October 6, 2017. Click link at "Additional Information" above to learn about the site and how to comment. The application and other relevant documents are available at: Queens Borough Public Library – Court Square, 2501 Jackson Ave, Long Island City, 11101 --and-- Queens Community Board #2, 43-22 50th St - Rm 2B, Woodside, 11377. 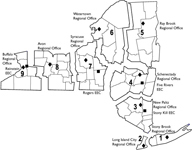 The New York State Department of Environmental Conservation (DEC) has received a Brownfield Cleanup Program (BCP) application and Draft Remedial Investigation Work Plan for a site known as 8 Walworth, site ID #C224239. This site is located in the City of Brooklyn, and is located at 8 Walworth Street. Comments regarding this application and work plan must be submitted no later than October 6, 2017. Click link at "Additional Information" above to learn about the site and how to comment. The application, Draft Remedial Investigation Work Plan and other relevant documents are available at: Brooklyn Public Library – Bushwick Branch, 340 Bushwick Avenue, Brooklyn, NY 11206 --and-- Brooklyn Community Board 3, 1360 Fulton Street, Room 202, Brooklyn, NY 11216. The is the last day to order birdseed through the Friends of Five Rivers’ Annual Birdseed Sale is Friday, October 6th. This benefit sale not only helps the birds, but also generates supplemental funding for Five Rivers’ programming. Orders will be available for pickup at Five Rivers on Saturday, October 21. For more information or an order form, visit www.friendsoffiverivers.org/node/73, or call the Friends at 518-475-0295. This program will explore the nighttime world through the ears and eyes of the animals that dwell in this mysterious realm. Join us on Friday, October 6, 6:30 PM for this mile-long walk as we learn about nocturnal animals through games, stories and our own nocturnal senses. This program is suitable for ages six years and up.